I adored this book. Fabulous writing - even better than Out Stealing Horses. I have added In the Wake by the same author, simply because he writes so well. Read this book. Read it soon. Read it now. This is one of those books that every second spent reading is enjoyable. It is about a family and the people making up this family. And it is about the wonderful strong relationship between brother and sister, a relationship that glows in the cold harsh Scandinavian landscape of the 40s. This relationship shines, bringing warmth to the cold, eccentric family of which the brother and sister were an integral part. Families, all of them, really are amazing and strange each in their own way. 3.5 stars for story, 4.5 stars for writingI don't know if there is a genre called artistic fiction, but that is the best way to describe this book. I really enjoyed reading it very slowly, creating pictures, sounds, smells, and emotions in my mind. Sometimes I would go back and re-read a passage just to be sure I was getting the full benefit of the scene the author created. There are some things about the story itself that are ultimately unsatisfying, but the writing is so exquisite at times that it's well worth the read. As ever, Petterson shines in his descriptions of outdoor scenes and experiences.This story has the same undercurrent of melancholy present in Out Stealing Horses. That seems to be Petterson's trademark.We never find out the name of the narrator. She tells the story of her girlhood in Denmark with her spontaneous, devilish older brother Jesper. They belong to a wounded and distant family where old hurts prevent warmth and communication. The girl and her brother cling to each other for safety and companionship. As WWII progresses, Jesper becomes involved in resistance activities and the girl is left alone. Without her brother, her life becomes lonely and colorless.Petterson plays free and loose with time frames and tenses in this book, even more so than in Out Stealing Horses. If you are a linear thinker needing orderly progression, you may want to leave this one on the shelf. I can't help but think of the novel I read right before this one, which also had a brother-sister relationship at its core (Machine Dreams). I enjoyed both, though beyond the close sibling relationship in both novels (the closeness due, perhaps in part, to parents whose relationship is not a good one), a war intruding on a somewhat isolated community in each, and an important similar plot point, the time period and the writing are different. As I was reading, I was also reminded of this quote from Zadie Smith's On Beauty : They [his siblings] were just love: they were the first evidence he ever had of love, and they would be the last confirmation of love when everything else fell away.Here, the narrator goes through her life, noticing what is around her, not connecting to others, missing her brother, though what is unsaid about that is what is the most poignant, as the feeling I was left with on the last sentence attested to.Though I liked this novel, I still prefer Petterson's Out Stealing Horses--a more mature, fuller work--over this one. As atmospheric, melancholy, and meditative as Out Stealing Horses and In The Wake, but I found To Siberia a bit more obtuse (which is not a complaint). A number of reviewers have called the later sections less satisfying, and suggested that the brother/sister relationship at the heart of the novel ends too early, but I had the opposite reaction -- as much as I enjoyed that relationship's developing complexities as the characters moved from childhood to maturity in the shadow of war, the novel really came together for me only after the unnamed sister is left to wander alone. So much of the novel concerns men (fishermen, soldiers, fathers, brothers) leaving women behind and unable to follow, either geographically or culturally. Through that lens, Sistermine's drifting at the end of the novel -- and the fact that unlike her brother, she never gets a name beyond the possessive "Sistermine" -- became less about her own rudderlessness and more about the limits she's given by a world her desires are too big for. 4.5 stars. A portrait of a girl during the 40´s in Scandinavia, a story about love between siblings, a coming of age, longing and betrayal. Petterson is the norwegian Master when it comes to painting pictures and describing feelings with words... I am stunned again! Please read To siberia and Out stealing horses. Hope the translation is good, because in norwegian it is just brilliant!!! I very much enjoyed this episodic reminiscence of one girl’s coming of age in a village at the far north of Denmark. The title refers to the narrator’s childhood dream of making a railroad journey across the continent to the crystalline wastes of what is for her an exotic storybook land. The early scenes in which she follows her brother (and hero) Jesper on various escapades are written with a naïve vividness that truly evokes glowing sights and fresh sensations, fears and pleasures of those childhood experiences that retain an air of enchanted memory. We may never have cuddled up with a warm cow on a cold winter’s night, but we fully grasp the unexpected wonder of it, having viewed the world through those eyes ourselves. There is a disappointing trip to the island of Skagen during a rainstorm that perfectly recalls just those small disillusionments that felt so huge. There are darker, more mysterious phantoms that flit across the stage as well, such as the death of a classmate, or the suicide of her forbidding grandfather, a doomed and drunken farmer; plangent chords that will remain unresolved. The siblings’ adolescence coincides with the coming of the Nazis, which circumstance proves too tempting to Jesper, a devout communist, leading to some taut passages and much whistling in the dark as the Dutch resistance comes sluggishly to life to throw of the oppressor’s yoke. In the end, we follow our narrator to the threshold of full adulthood of unflinching resignation that, in a sense, finally transports her to that ice palace – or bleak gulag – of her girlish fantasies. I haven’t yet read Out Stealing Horses, so I can’t compare the two, but the wistful, haunted quality of this book reminds me a bit of the impressionistic, memory-filtered novellas of Andrei Makine (Dreams of My Russian Summers). It is a little what I imagine reading Proust to be like, if Proust weren’t too long for me to read. This is the third of Per Petterson's novels that have been translated into English. The other two deal with grown men struggling to come to grips with tragic events in their lives. To Siberia is told from a woman's perspective; a woman, at the time of the telling of the story, in her 60's looking back over her childhood and troubled transition to young womanhood. Invariably, I find Petterson's books acquire new meaning and certain details are illuminated by re-reading them. His books seem deceptively simple, but there is a lot of darkness there and certain sentences stand out much as great lines of poetry do. He writes certain sentences which convey almost a novel's worth of meaning in them. The only other writer I can think of that does that is James Baldwin who can convey all the bittersweet heartbreak and pathos of emotional existence in one well-written sentence.This book starts out differently than Petterson's other two in that it reminds me of a Carson McCullers' novel or an early short story by Truman Capote. The protagonist is a precocious girl and her family is somewhat eccentric - from her Baptist parents to her young Communist brother. They live out in the sticks in Denmark and most of them seem to have odd personalities shaped by the largely uncontrollable forces of life. The book starts off pleasantly enough, however, it would not be a Petterson book if it did not take a dark turn. This one does and leaves you wondering at the end about the sanity of the main character who comes of age during the Second World War and is shaped by its events and those of the immediate postwar era. I had tremendously high expectations for this book, told by an older woman who looks back reminiscingly at her life growing up in Denmark, pre- and post-WWII. It tells the tale of this woman's relationship with her brother Jesper, his contributions to Nazi resistance, and her less-than-warm family life.While so many others raved about the prose, I just didn't feel it. Perhaps, because this was translated into English, something was lost from the original Scandanavian meaning? Personally, throughout the whole I remained disconnected from the characters, never feeling like I really knew them or their passions. Deaths occurred and emotions were barely touched upon. It didn't move me...it didn't touch my heart. As for the relationship between this young girl and her older brother, to me, it seemed as though it was a childhood sweetheart rather than a sibling. Again, I did not FEEL. I had hoped this book would reach out and tug at my heartstrings as I fondly looked back at my own special relationship with my brother. It did not do this. To me, it was just a bit warped. I suppose this is to be expected considering, this girl (who remains nameless through the entire book) has a very warped family life, with nary a mention of parents other than a few handfuls of times when they are scolding her or her brother. It was difficult to get through, and even more difficult to transport myself into the place and time in which this story took place. The sentences ran on and for me, the story jumped all over the place. I wanted to love it, but honestly, it was okay at best. This story is even more poignant than Out Stealing Horses, and as beautifully written. Here is a passage to illustrate the writing:I cycle north at dust towards Kæret Beach past the marshes at Ronnene where the seagulls sit in long rows in the shallows beyond the reeds,and all the rows take off as I ride past, unfold like gray-white sheets and land again in the dim light that slowly fades and disappears towards Skagen. There are thousands of them. I hear their soft rushing and feel the wind in my face as if this were the last time I would cycle here in just this way, and I see myself from the outside as more and more often I do, in a film at the Palace Theater progressively pone row of seats farther back from the screen, on the same brown bicycle I have had for many years, and my hair streams back and at the same time almost merges with the advancing night, and I hear the creaking of my right pedal against the chain guard, squeak, squeak, again and again a thousand times, and my breath, puff, puff, quite alone with no other sound now the gulls are silent.The unnamed narrator is strong like Lisbeth in Stieg Larsson's, but not twisted. Her relationship with her brother Jesper is central to the story, even when they are apart: all other characters seem peripheral. The spare writing was intriguing, and the setting of Jutland, Denmark pre- and during WWII (when the Nazis occupied Denmark) was ripe for exploration, but somehow this book ended up making me feel wanting of more. A relationship between sister and brother is developed, then as war happens, the siblings go separate ways. I wish the book was twice as long, but as it was, it felt too slight, leaving interesting ideas and settings introduced, but not explored enough. Du vet moren til hovedpersonen i Jeg forbanner tidens elv? Dette er romanen om oppveksten hennes, på tredve og førtitallet i Danmark. Den er fantastisk. Og Petterson er kanskje den av de gamle ML-forfatterne som skriver de beste kvinnene. Dag Solstad skildrer kvinner som om han var et romvesen som hadde fått forklart kjønnsdrift i voksen alder. Petterson skildrer svangerskapskvalme innenfra på en måte som lurer meg til å tro at han har vært litt gravid selv. Beautifully written, vividly deep characters and an underlining melancholy. It left me sad but touched. As full a sense life as I found in Petterson's OUT STEALING HORSES. Beautiful young female narrator, as precocious, stubborn & sensitive as Munro's Del in THE LIVES OF GIRLS AND WOMEN, and a brother-sister relationship here that made me weep. I can't help but give a prose-tasting from early in the novel (p 16-17) when the narrator and her brother Jesper go into the barn to get warm; Jesper speaks of Dorit the cow:"'You have to say something, you must talk to her,' says Jesper from behind the wall, but I do not know what to say, all the ideas I think of are things I cannot say aloud. It is cramped in the stall, if Dorit turns around I shall be squeezed against the wall. I stroke her neck and lean forward more and start to tell the story of the steadfast tin soldier into her ear, and she listens and I know Jesper is listening behind the wall. When I reach the end where the tin soldier bursts into flames and is melting, I lie down on her and put my arms around her neck and tell her how the puff of wind comes in at the window and lifts up the ballerina and carries her through the room into the fire where she flares up like a shooting star and dies out, and when I have finished I dare not breathe. But Dorit is amiable, she hardly moves, just chews and the warmth of her body spreads through my coat, I feel it on my stomach and slowly I start to breathe again. It is Christmas Eve 1934 and Jesper and I lie there each in our stall each on our own cow in a cowshed where all things breathe and perhaps we fall asleep, for I do not remember anything very clearly after that." Per Petterson is such a gifted author that with the simplest of language and briefest of sentences you are somehow transported into a world of sharp images.This poignant tale highlights the lives of a very close brother, (Jesper) and sister, only known as "sistermine", who grow up in a very rural sheltered community of Denmark under the influence of rigid, very unworldly and uneducated parents. The story is told through the eyes and voice of "sistermine". As she reminisces, the scars of the times and the war upon their lives are slowly revealed. It follows them during the time preceding World War II and continues into the post war and modern world. It illuminates how their inexperience and naivete directly effected the choices they made. At times, they seemed painfully unaware of the risks they were taking or the consequences of their behavior. The various tragedies and momentous events that occur during the novel serve to illustrate their family dynamic, disappointment and lives of hardship, as they mature and pursue their futures.The major negative for me was that some locales and names of streets etc., were unfamiliar and I could attach no geographic location to that place in Denmark or Scandinavia. The description of the streets and places of their travels often made the reading lose momentum as I struggled with pronunciation and relevance. At that point, the impressive pictures being presented by the exceptional prose, sometimes faded. This is the third Per Petterson novel I've read recently; I think they may be some of the best novels I've read from a living author. I've probably said it before, but if you like the work of Knut Hamsun or W.G. Sebald, then I highly recommend Per Petterson's novels. He has a simple, sometimes lyrical style, much like Hamsun (he's also Norwegian); memory and family play a big part in this story. My only regret is not saving it for the winter time (though there were some scenes set by the water, so reading it while at the beach did seem fitting) as I really wanted to it be snowing by the end of the book. This is the memories of a childhood in the 1930s & 1940s in a small town in Denmark, in a fragile family at a turbulent time in the world by a narrator who believes that all her significant living and loving was experienced by the age of 23. Had this not been told by an incredibly gifted pen, the short novel would have fallen very flat. But, this author creates a stunning tapestry out of very slender threads. I like this early half-light, the mild air from the sea, standing inside looking out without being seen, and there are almost no sounds from the street, and I can think and remember who I am before anything new comes along. To Siberia is a collection of memories; the unnamed narrator is a Danish girl known to the reader only as Sistermine; a term of endearment by her older brother Jesper. Sistermine longs to go somewhere far away, not necessarily warm. In fact, she wants to go to Siberia along the Trans-Siberian Railway. A sentiment that - to me, at least - rings refreshingly true: Not everyone born in the cold longs for the warmth. Jesper, however, longs for a very different landscape; the heat and mountains of Morocco, and this marks a cruicial difference between the siblings. Their bond and eventual separation is at the very heart of the story; Sistermine's memories always somewhat circles around her brother, whether they are marked by his warm presence or his cutting absence. – Put your hand in front of your eyes, Sistermine, and spin round three times, then tell me which is the way home.I did as he said, I spun around so I almost fell down, I opened my eyes and peered in all directions. – I don’t know.– Then anything can happen.The distinguishing Scandinavian landscapes make the setting; the author is Norwegian (born in Oslo in 1952), but he grew up with a Danish mother and while the story travels briefly through Sweden and Norway, it mainly takes place in Denmark's northern parts of Jutland in the time surrrounding the German occupation. 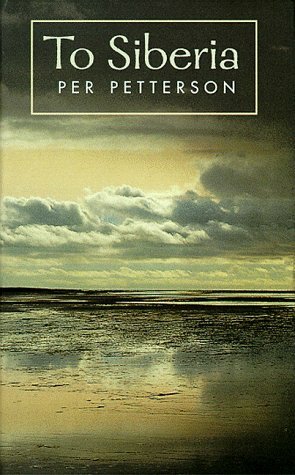 Petterson's language is atmospheric and often sorrowful, at times breathtaking. An early moment that sets the mood of the novel is Petterson's pertinent description of the narrator's first long-awaited meeting with Skagen. It takes place during the winter when the streets are empty, there is not a single tourist in sight, every local is hiding inside their little yellow houses, and you go to Grenen at the spot where the two seas of Kattegat and Skagarak meet and you try your best to not be swept away, and you have sand and wind and water in your face and your voice. Even though it is somehow not like she imagined - colder, harsher, and not much more than sand like her father said - and the family get stuck in the rain at the train station because every place that could possibly offer them shelter is closed for the season, she still loves it. And after that trip, she is ready to travel further:Ever since the trip to Skagen, every journey I made by train was a potential departure on my own great journey.Even though everyone, including Jesper, keep warning her about Siberia's cold and prison camps, her mind is set on its railway and its houses made of wood that absorbs the sunlight. And in her dreams, Jesper comes to visit her there. Sistermine is very preserving, even in her younger years, very much inspired by her adventurous older brother and his numerous ways of rebelling against the traditional and religious household and environment they were born into. She knows her own way and isn't afraid to hiss an insult in the direction of a German soldier, to the horror of her father. What perhaps is most characteristic about her is the way she is always very determined about her somewhat humble dreams, even as she seemingly just as coolly accepts it when they no longer seem to be able to come to pass. The war and its devastating effects on a small nation and a fragile family does not make the characteristically gloomy atmosphere of the story on its own; it's accompanied by Petterson's unforgivingly dark but stunning imagery. The image of the young siblings' grandfather hanging in the cowshed (where the siblings usually go to lie on top of the cows to absorb the warmth from their bodies and whisper stories in their ears in tender voices) with a note in his pocket sayingI can't go on any longer.Sistermine reckons she understands it even though she's not entirely sure what it is he couldn't go on with. Then there is the image of young Sistermine dragging her half-drowned brother from the bottom of the harbour basin:– I thought you were en angel, he mumbled.– Angels have fair hair. Besides, they don’t exist.– Mine do, and they have dark hair.The image of the siblings nervously awaiting their father's arrival with the ferry, soaking wet from their endeavors; the anger in their father's face as he sees them (that is actually fear, as she later learns), the animals being lifted with a crane off the boat behind them to go to the slaugtherhouse, and the pig that commits suicide by running straight off the edge of the harbour and being crushed against the boat before it drowns without even making a sound. The slaughterhouse, in fact, is a reoccuring element as the sound of the animals scraoing their hooves at night, waiting, haunts Sistermine when she sleeps. In some way, there is a sorrow lurking from the beginning. She reflects: Over the sea in the east the weather that has passed lies in a dark line at the far end of the world and it is warm now and a big sky rises like a film of blue over the whole of Denmark and behind it no one knows what there is. Sometimes at night I lie gazing out of the window and up at the sky and force my thoughts through the firmament to see what they meet on the other side, but in spite of what I learn at school, everything dissolves into small pieces and I have to go to sleep or my head starts to ache.The dominating darkness and - ultimately - tragedy of the story is somehow mixed with a sense of nostalgia within the striking Danish imagery. For me as a Dane, specifically, anyway. Names of streets I know; recognisable descriptions of the tall, slender silhouette of Hans Christian Andersen with his hat, bending his head in order to step through the low door frames of the small northern inn he is staying at (everything is smaller and, in a way, humble up there); the harbour busy with traffic and boats gliding through dark waves connecting the islands to the mainland; and long train rides through flat, endless landscapes… Those train rides seem a kind of summary, not just in terms of the season but in terms of your own stance in life. You are here now. This is what is left. Disappearing tracks behind you and an open horizon ahead. A sense of hope mixed with a feeling of an ending. Poker ran along the edge of the water with a seagull’s wing in his mouth, and I was so young then, and I remember thinking: I’m twenty-three years old, there is nothing left in life. Only the rest. The narrator's last recounted memory, and her reflections on the war and the loss of her brother, is simple and cutting. While her reaction to her fate may even seem somewhat distant or indifferent seen from the outside, it manifests the emptiness and devastating, ever-lasting effect of loss. A silent dissolution. Perhaps the very acceptance of misery in some ways hits harder than dispair and resistance because we don't want to acknowledge it or recognize it in ourselves. Everything Per Petterson writes reads like spun gold. It's just beautiful, immersive writing. To Siberia doesn't disappoint, but the story feels less developed than some of his other books. I recommend To Siberia for anyone who is familiar with his work, or to anyone who loves the low-key, sensual richness of Scandinavian fiction in general, but if you're new to these, I'd recommend his other books, I Refuse, or Out Stealing Horses, for a more intense reading experience. After reading ‘Out Stealing Horses’ by Per Petterson, I thought I will read ‘To Siberia’ written by him, which I had got along with ‘Out Stealing Horses’. I finished reading most of the book yesterday – and if some sudden things hadn’t cropped up, I would have finished the book yesterday itself, which rarely happens for me, because I am a slow reader – and finished reading the last few chapters today. Here is what I think.What I think‘To Siberia’ is about a sister and brother growing up during the Second World War in Denmark, when the Germans occupy Denmark. The sister is the narrator of the story, and her name is unknown. The brother is called Jesper. The first part of the book is about the sister and brother growing up in a small town in Denmark and the adventures they have together and the happy and sad moments that they experience. Then the German soldiers come into Denmark and things change. Jesper works with the resistance group against the Nazis and has to leave the country at some point of time. The war ends but for some reason the sister leaves the country. She works in different places – the telephone exchange, a glass blowing factory – and finally ends up as a waitress in a café. Then she has a brief affair with a customer who frequents the café and gets pregnant. She decides to go home and spend time with her parents while she is expecting, but when she lands up at home, she discovers that her brother has died. Her mother refuses to take her in because her mother is a very strict Christian and the narrator is pregnant without being married. So, our heroine, the narrator, decides to spend her time with an acquaintance in their sheep farm taking care of the ewes that are going to lamb soon, while she herself is expecting to give birth to a baby. The story ends with this. It is not very clear what happens next – whether the narrator gave birth to a baby, what happened after that, did she fall in love, did she get married, did she finally manage to travel to Siberia. ‘To Siberia’ had what I have come to expect out of a Per Petterson book now – long and beautiful sentences. However, in this book, the focus was more on the plot rather than on the sentences and the language. I somehow felt that this was one of his early works and Petterson’s prose was still getting finetuned and it all came together gloriously in ‘Out Stealing Horses’. I liked ‘To Siberia’ – not as much as ‘Out Stealing Horses’, but I still liked it. It is a story of growing up, of the love between brothers and sisters, of how the Second World War affected people. I will leave you with some of my favourite passages from the book. And then it began to rain. It came from all directions at full speed and not on us, but against us with the wind right in our faces; we tried to turn away, walk sideways so as not to drown and Jesper gave up and ran out into the middle of the road and began to dance with his arms in the air. When they have gone away they leave a dusty emptiness behind them, the air is stuffy and lifeless like the bottom of a purse, and my father gets to work on the cupboard or the chest and shapes up and remakes and polishes and rubs until the surfaces shine with the glow that is at the heart of all wood, shining without any varnish and with handles of finely carved bone. After a few days they come to fetch it, and then the piece stands there in the centre of the floor as good as new, better than new, and I have searched for the word year after year, looked it up in books and thought and pondered and found substance. They bring a wreck and leave with substance, and they see it and look dumbfounded and praise my father until his ears flame. When they have gone he has charged them the same amount as last year and the year before that and the year before that again.“I thought you were an angel,” he mumbled. “Angels have fair hair. Besides, they don’t exist.” “Mine do, and they have dark hair.” “You can learn a lot about human beings by studying insects,” he says, “their world is like ours in miniature, they just have a far better distribution of work.” There may be clarity and contrasts in Lone’s family, but I don’t care for insects. Insects scratch and tickle, they creep up under your dress and sting you. I usually sit listening, and a lot of what was said was meant for me. I was a woman and young, and they grew red in the face and excited, with their hands in the air competing for who would come out with the most brilliant riposte. Those elderly men infected me with their enthusiasm, they did not speak in one voice, they interrupted each other and dressed up history in words and flickering yellow-brown pictures until it felt like a home, and I was the guest of honour.Have you read ‘To Siberia’? What do you think about it? i want to give this book five stars but it's only the second book i've read by him and as in love as i am i think he might get better. out stealing horses was better than this so i don't wanna give them the same rating. either way, he's my new love. i think he has 5 books total and this proved to me that i'm going to read them all. the writing style is the same as out stealing horses: sparse. i guess i really like this style because i've started reading more and more books like this. it takes place in denmark focusing on a sister brother relationship before and after germany's occupation. with this author, though, i don't really care too much about the story it's the setting and pacing that i adore. they live in a small village. life moves slowly. then the germans come. the brother gets involved in subversion. and i don't wanna give too much away so i'll stop there. the only thing about the book i think could've been better is the ending. it was like he didn't know where else to go with it because the ending feels flat. it reminds me of other books where the main character comes back home for redemption or acceptance and is shut down. now i don't mind the choice of the ending but i kind of wish he spent more time on it, that it lasted longer. it felt kind of packed in and it didn't need to be. either way i highly recommend this author but so far i'd say start off with out stealing horses and see if you like him enough to continue reading. To Siberia broke my heart. Not because of any particular character or event, but rather more because of the overall tone and cadence. The language left me with a feeling of desolation. The actual events of the book are almost rendered moot as a result, as the reader is often already feeling anger or sadness when a situation arises that is meant to evoke such reactions. Especially by the end, I felt like I pretty much knew what was coming but that it hardly mattered because my chest was already appropriately tight by that point. There's this sense of the entire story being surreal, even when the scenario being discussed is a terribly normal one, because surreal is how everything feels when one has lost hope, considers happiness virtually unattainable, and life meaningless.Truly, I've never read a book that captured the feeling of being lost and rudderless so perfectly. Rarely have I read something that focused so completely on idleness and stagnation that was this compelling. As I closed the back cover, I found myself simultaneously wanting more but questioning whether I could actually handle it if more were offered. I have no complaints about this book -- only cautious praise. My copy from the goodreads giveaway arrived and as I wrote earlier I am on a reading jag so I am starting this today.....I finished reading this book a few days ago and finally have the chance to sit down and write that I feel in love with the writing and story from the first page and I read as swiftly as time would allow.Per Petterson's writing style is sparse, emotive and very evocative. Feelings and experience move effortlessly from word to stark and well defined imagery. To Siberia is a smart coming of age story set in Denmark against the backdrop of WWII, where family, community and history play out on a small scale through the eyes of a young girl. The story she tells is personal, quiet of her childhood and love of her brother, the catalyst from which she gains experience as she grows beyond childhood into womanhood. A story she tells with deep feeling for her brother, her family and the community she came from. This was given to me as a Christmas gift from my boss, who thought I would love the author (Norwegian, Per Petterson) but had never read the book himself. I enjoyed it and found many strong lyrical moments to revel in. At the end, however, I felt more critical of the narrative structure and the choice of narrator/protagonist (a nameless young female who begins as a child and grows into young adulthood during WWII)... I particularly felt that she grew less believable as she aged and couldn't help wondering whether Petterson shouldn't actually have written the story about a different character altogether (her older brother Jesper, who she adores). She never makes it to Siberia, except in a psychological sense, and the book ends in utter hopelessness as she looks ahead at the rest of her life as nothing but a long wait for the end.There is talent here, but I suspect that Out Stealing Horses is a more polished novel. As beautifully rendered as "Out Stealing Horses," and with the same frank clarity, "To Siberia" explores some of the same themes as Petterson's more renowned work - chiefly through the examination of childhood memory from an adult perspective. While I loved "Horses" and enjoyed "I Curse the River of Time," I expect this novel will stay with me even longer, partially because of the complex psychology of the narrator, and partially because of the historical significance of its setting (the Danish resistance to Nazi occupation), but mainly because this book explores a wider range of emotions and complicated relations than the others I have read. Plus, I find the ending more satisfying and appropriate for this novel. "To Siberia" has its flaws like any novel, but reading this book has been a true pleasure. So much of the world around "Sistermine" is cold, wet and white. The snow and the sand and even the milk. Her brother Jesper wants to escape their cold and harsh home and parents by getting himself to the warmth of Morrocco. But the heroine thinks she'll find happiness somewhere even colder, wetter, and whiter, so she dreams about getting herself "To Siberia. "I'm a fast reader, but I found myself deliberately slowing down as I read to better savor the language - so evocative of the time and place. I don't think I've ever read a novel that actually made me feel the cold so deeply. The relationship between Jesper and his sister is lovely and real, given the distance between the children and their parents.I didn't like quite as well as "Out Stealing Horses", but this was still a very good read. Petterson's beautifully written, dream-like novel takes place in German-occupied Denmark during WWII. The narrator, a young girl coming of age, comes from a superbly dysfunctional Danish family. Her brother becomes involved in the Danish resistance fighting and escapes to Sweden. This is the second of his novels that I've read and it didn't dissapoint. His writing is highly descriptive yet succint. Even in translation it was gorgeous. The characters are formed from that Scandinavian angst that only Bergman can do better. The Danish emotional winter doesn't get much darker than this story. You won't want to put it down.